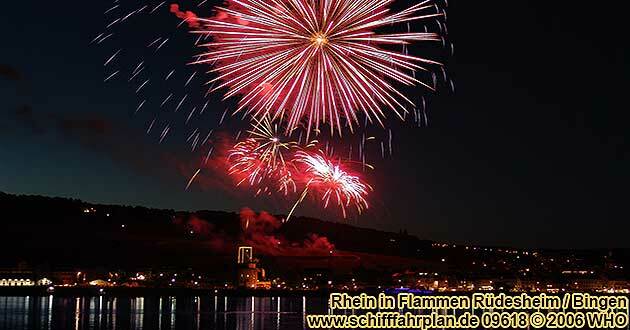 Welcome to the world of fireworks on the Rhine and Moselle rivers in Germany! Since 70 years a lot of towns on the Rhine and Moselle rivers arrange the annual wine festivals. The actual highlights are the fireworks in the evening where exploding firecrackers and brilliant cascades of light from Germany, China and a lot of other countries contribute to the most beautiful spectacle in the summer nights. During the fire magic of the firecracker rockets in the velvety black sky and the Bengal fire, the boat parades mirror themselves in the water and on the landscapes of the Rhine and Moselle rivers. On the shore the people celebrate life beneath the sparkle and glitter of firework "stars" as a seemingly endless row of ships navigate up the Rhine and Moselle rivers to present their exploding, spectacular lights. The towns, castle fortresses, palaces, and castle ruins are shown in bizarre outlines and shine in the red light of Bengal Fire. The light festivals on the Rhine and Moselle rivers between Mainz and Dusseldorf as well as Koblenz / Coblence and Trier interferes permanent unforgettable impressions. Nowhere else will you see such a fascinating, unforgettable display of fire, water and light, all set in the majestic landscapes of the Rhine river and Moselle river regions, a land of beauty and history. The following firework schedule will also inspire you. From May until September, experience the enchantment of the region which will shine during these months. 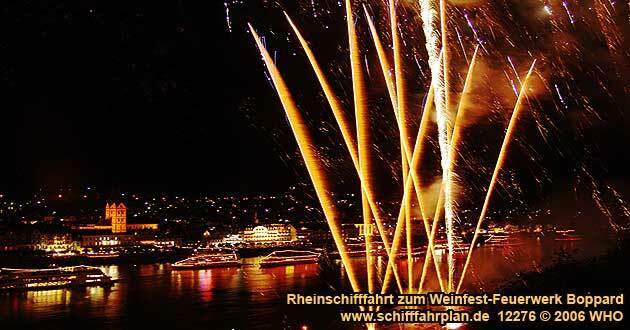 Fireworks on Rhine and Mosel rivers  a moment of magic you won't want to miss in the romantic Rhine and Mosel river regions. 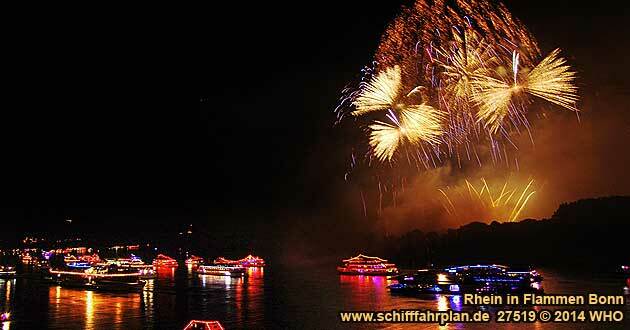 Firework displays at Siebengebirge (seven mountains) from Linz, along Remagen, the Rhine river island Nonnenwerth near Bad Honnef, Konigswinter to Bonn: "Light boat parade" along the five firework displays with more than 40 boats. 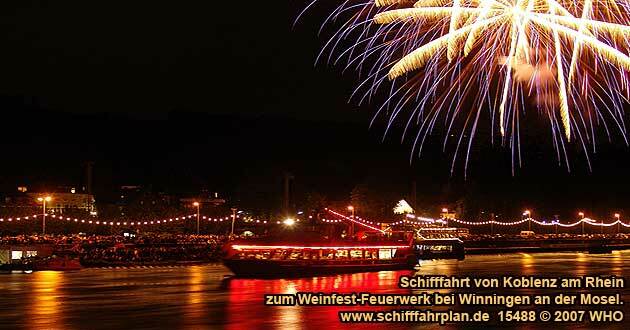 Boat parade to a music firework display on the Middle Rhine River. DJ music and dance on board. Possibility to visit the red wine festival in Assmannshausen on the Rhine River. 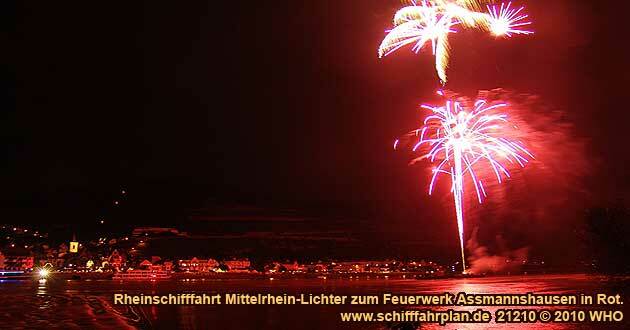 7 splendid firework displays around the Binger Loch between Trechtingshausen, Assmannshausen, Bingen and Rudesheim. "Burning" castles on both sides of the Rhine River. "Light boat parade" with more than 40 boats. 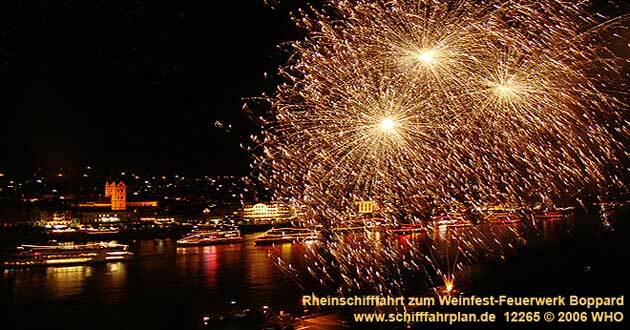 Firework with colorful programm in the Rhine and Moselle River region in Koblenz / Coblence, but also in Spay, Braubach, Rhens and Lahnstein. "Light boat parade" with more than 60 boats. Boat parade to a firework display on the Middle Rhine River. DJ music and dance on board. 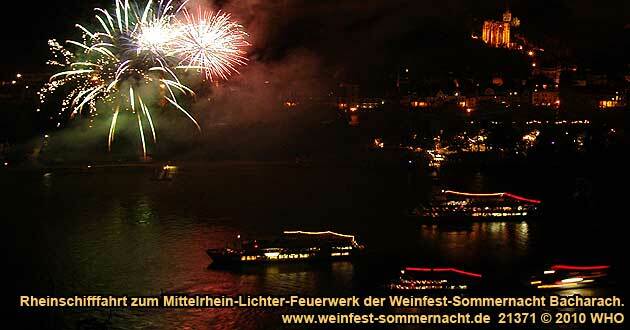 Possibility to visit the wine festival summer night in Bacharach on the Rhine River. Winningen on the Moselle river (about 12 km or about 8 miles from Koblenz / Coblence on the Rhine river). Boat trip with live music and dance. Firework display with musical accompaniment in the medieval "Town of Towers and Wines" with wine festival in the historical market place. 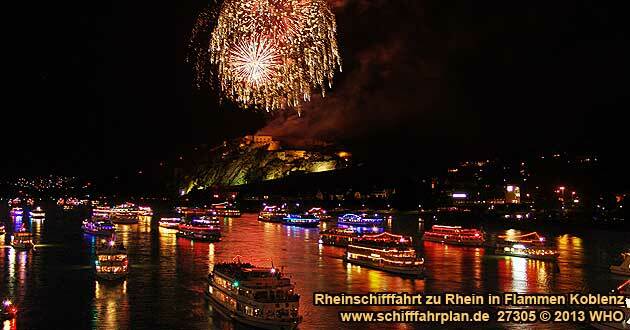 "Light boat parade" in the World Heritage "Oberes Mittelrheintal" with more than 40 boats. 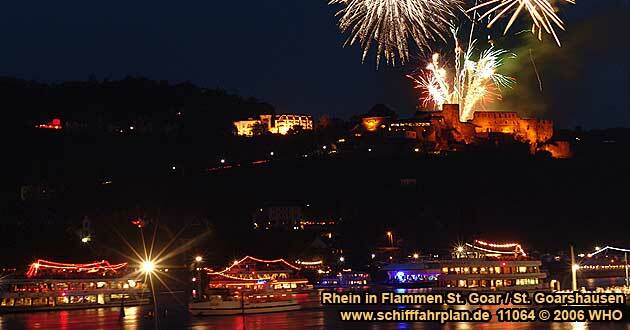 Spectacular firework display between the two sister towns near the famous Lorelei Rock with wine festivals in St. Goar and in St. Goarshausen. 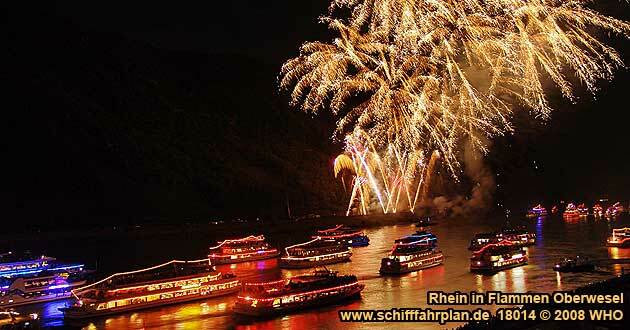 "Light boat parade" in the World Heritage "Oberes Mittelrheintal" with more than 40 boats. Firework display "Luminous Night on the Middle Rhine River"
Firework from the right Rhine River side, opposite Boppard. 1st wine festival weekend in the wine town Boppard. "Light boat parade" in the World Heritage "Oberes Mittelrheintal". Firework from the right Rhine River side, opposite Boppard. 2nd wine festival weekend in the wine town Boppard. 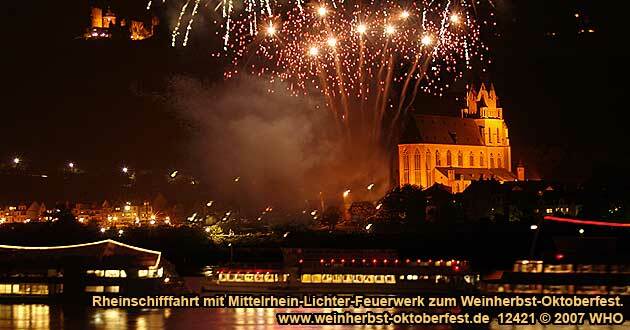 "Light boat parade" in the World Heritage "Oberes Mittelrheintal". Boat parade to a firework display on the Middle Rhine River. DJ music and dance on board. Golden wine autumn and Swimming Federweisser vintage festival on the Middle Rhine River.